AYPC Services – Page 6 – All about Tech! Google Chrome does a great job at blocking pop-up windows out of the box, but sometimes it prevents them even if you’re expecting one from a trusted site. 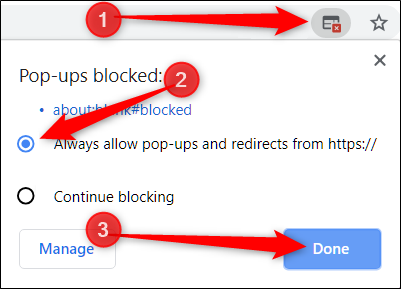 Here’s how you can take control and allow or block pop-ups in Chrome. By default, Google Chrome disables pop-ups automatically in the browser; something easily overlooked because that’s how the internet should be presented. Not all pop-up windows are malicious or invasive. Some websites use them for legitimate reasons. When Chrome blocks a pop-up from a website, it displays an icon with a red X in the corner of the Omnibox. After you click “Done,” refresh the page to save your choice and see any intended pop-ups on this website. Alternatively, if you just want to see a pop-up one time, click the blue link in this window and you’ll be redirected to the pop-up that was initially blocked. It’s been a rough couple of weeks for Samsung—the first Galaxy Fold hands-on posts looked promising, but then review units started breaking. Now, the company has canceled launch events in China and delayed the Fold’s release indefinitely. Ouch. The Fold, which went on sale to customers last week, was slated to be released just three days from now, on April 26th. But with all the display issues on review units, Samsung is pushing back the launch. It a statement, it confirmed that it would announce a new release date “in the coming weeks.” That means anyone who pre-ordered the Fold will wait for at least another month, most likely more. While this isn’t as disastrous as the exploding Galaxy Note 7 fiasco from a couple of years ago, it’s still a pretty bad look for Samsung—especially because we all remember the Note 7 situation pretty clearly. It’s been nearly three years, but that’s still not long enough to undo the damage. The issue is that this is the second time something catastrophic points back to Samsung’s quality control. The Note 7’s battery problems should’ve been found internally before they became the public’s problem. And while the Fold’s display issues were found before the public release, it’s incredibly troubling that it wasn’t noticed during Samsung’s testing. It took the device getting into reviewers’ hands before it became apparent. The statement from the company points out that “initial findings from the inspection of reported issues on the display showed that they could be associated with impact on the top and bottom exposed areas of the hinge.” Do they not do any sort of impact testing during development? Either way, the company claims it’s going to fix these issues before releasing the device to the public. It’s also going to “enhance the guidance on care and use of the display including the protective layer”—you know, so people don’t remove the screen protector that isn’t a screen protector. Oof. But on to other news now. Apparently, the Nokia 9’s fingerprint reader can be fooled with a pack of gum, AT&T settled the lawsuit over its 5G E network, OnePlus sets a date for the OP7 announcement, and more! ASUS has long been one of the last holdouts making high(er)-end Android tablets, but the writing is on the wall for its ZenPad line. As its ZenFone line continues to get more popular, it’s going to move its focus away from Android tablets—which have long been dying, anyway—and onto something that, you know, actually makes money. I guess if you want an Android tablet now, Samsung is one of the last options for decent large-screen devices. The end of an era. Excel’s Text to Columns feature splits text in a cell into multiple columns. This simple task can save a user the heartache of manually separating the text in a cell into several columns. We’ll start with a simple example of splitting two samples of data into separate columns. Then, we’ll explore two other uses for this feature that most Excel users are not aware of. For the first example, we will use Text to Columns with delimited data. This is the more common scenario for splitting text, so we will start with this. In the sample data below we have a list of names in a column. We would like to separate the first and last name into different columns. 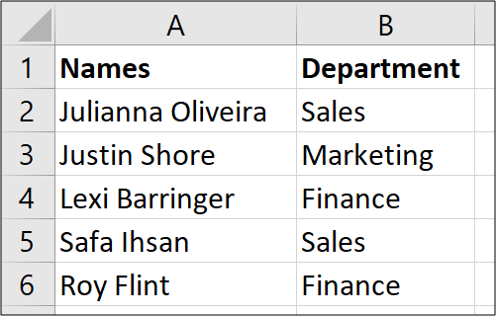 In this example, we would like the first name to remain in column A for the last name to move to column B. We already have some information in column B (the Department). So we need to insert a column first and give it a header.